This past weekend the Niño’s went to Grand Junction on an outing. 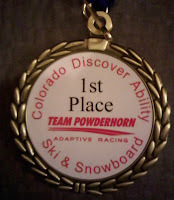 Our team was invited by Team Powderhorn to a race event at their local ski area. Grand Junction is located a mere 90 minutes from us, a stone’s throw relative to the other Niño’s events. Parents were invited, but our attendance was not mandatory. We jumped at the chance to send Alex on this short trip. Cammi and Paul thought it would be fun to make this a team building experience. They left early Saturday morning, raced all day Saturday and spent the night. As an added bonus, Colorado Discovery Ability hosted a dinner and a dance for the athletes. Alex loves to boogie, and as she told me, she spent the night dancing with all the kids. She was in her element. The weekend respite was nice for us. I love it when Alex has outings. She loves the excitement of the events, the hotel room, and the camaraderie of her team. As an aside, the fact that she won the gold medal was only briefly mentioned. Alex thrives when she is with people similar to her; she is comfortable and confident. 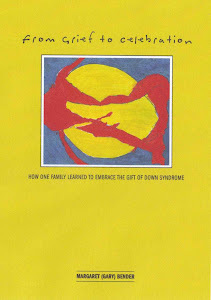 When Alex was little I went to a couple of lectures about older children and adults with down syndrome. Mostly, I was curious to what Alex’s future would hold, but I also wanted to learn about my future. Would Alex live independently? Were there options available for her? How would she progress academically, and socially? It was a great way to begin to think through our futures. My motto; never too early. At the time I learned, many adults with disabilities, in particular down syndrome, prefer to socialize with people with similar disabilities. Living communities, social groups and continuing education are available for adults with down syndrome. Many of these programs are very successful and the people involved, with and without, down syndrome are happy. To me, this was exclusive, and did not promote integration. This discouraged me. I struggle with one philosophy; I did, and still do, support inclusion. I believe not only will Alex benefit from being included in as many academic and social situations are possible, so will the “normal” population. I have seen this often; parents and kids relating how Alex has changed their lives; opened their eyes to new things in the world. This is also good for Alex; she uses these experiences to model her behaviors. I do not believe in segregating Alex from the “normal” population. However, what I did not believe at the time, but know now….Alex shines when she is with other people with disabilities. She can interact equally, both socially and competitively. She feels friendship, pride and success. 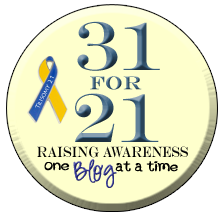 As the mother of a disabled child, it is rewarding to see your child so happy, particularly since there are struggles in other parts of her life. I have taken a long hard look at myself and my daughter. What is more important, Alex’s happiness? Or my view of how the world should be? This is a hard reflection for the parent of a child with down syndrome, or at least it was for me. I needed to come to grips with Alex’s dreams versus my dreams for Alex. In my heart, and most importantly, I know Alex deserves to be happy, just like her brother and sister. It is my job to help create this for her. But, secondly in my heart, I will always know the world is not perfect. I feel a responsibility to change discrimination against the disabled, if only a little, and make it easier for the next generation. The generation before us provided that example, and I will continue. Inclusion, segregation, integration, these are only words; it is the actions that will make the difference. I will continue to practice what I preach – we live the ordinary life of an extraordinary girl.